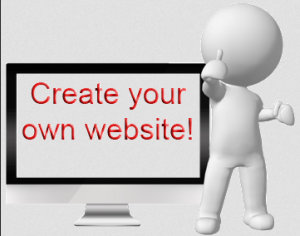 Would You Like To Know How Very Easy It Is To Build Your Very Own Website! I can show you how to do it for Free! First – Let’s Dispel Any Fears You May Have! I know when I first considered pursuing an online income I was concerned about how much I did not know about computers. My story of how I was first introduced to this idea of online marketing and my ensuing journey you can read here. I knew basic navigation of the internet and a few little other things like copying and pasting, and that was about it. I didn’t grow up with computers and I only came to own a computer in the past couple years. The only education I had ever received was some tutoring at the local library where I had learned the little I did know. As you are here and reading this, you have all the knowledge you need to get started. There is no need for a college education and you do not need any programming skills – No knowledge of HTML or CSS coding required – No CMS knowledge required. And it is a good thing, because I could not have even told you what any of those were when I started. I am excited to share with you! You will need a CMS – Content Management System. WordPress is a true CMS and the most used website framework in the world. First – Select your Domain Name – this is your Internet Address, your URL (Uniform Resource Locator). Second – Decide on your Website Name – this is your invitation extended for visitors. This is based on your chosen subject of interest, your niche. Third – Select a Theme Template – this is your choice of background for your website. As a starter member you will have approximately 12 theme templates to choose from. Fourth – Click the Button – “I’m Ready, Build My Website Now” – and in approximately 30 seconds your website will be built! Here Is A Video Demonstration! So What Did You Think? Is It Right For You? You’ve seen how easy it is to build a website – anyone can do it – all you need is the desire and the willingness to supply the effort! And remember at SiteRubix.com you can build your website for FREE, absolutely FREE! You have absolutely nothing to lose and a new start just waiting for you! If you watched the video you already know that you always have 2 Free websites, even if you should decide to trash one, you don’t lose anything! So Why Not Try It ? Go Ahead! Now that you’ve seen how to do it! Just type a Domain Name in and Press the Build It Now Button! Then come back and tell me all about it! Building your Website is building the framework for your new Internet Real Estate! If you haven’t already set up your Starter Account for $0 just click here, and get started. If you would like more information on the FREE Starter Account Program or Wealthy Affiliate’s Paid Membership Program please read my Getting Started page. If you would like to share, please feel free to do so below! Wealthy Affiliate community is the most helpful hand in the world for me, who wants to build an online business and build online presence with a website. Their positive feedbacks and motivation will support our goal to have a successful business online based on our passion. Wealthy Affiliate has been a blessing to me as well! I could not have accomplished all that I have without the knowledge I have gleaned at Wealthy Affiliate and the support of the incredible community! The support of such a special community is definitely an asset! There have been times when I needed guidance and all I had to do was go in live chat and there was someone to guide me to just the information I needed! And you are so right about the camaraderie that is so uplifting as we all support one another in achieving our goal of a successful online income! This is a great information. 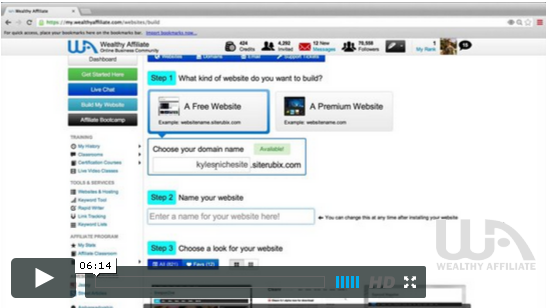 Wealthy Affiliate is where I built my first successful website too.. It was the best online decision I ever made. I joined Wealthy Affiliate in July 2013. Since then with the awesome training tools support and 24/7 Live Chat I have learned and built a very successful website. I feel exactly the same way, that Wealthy Affiliate “was the best online decision I ever made”. Wealthy Affiliate is a Virtual Online Academy, with a greater wealth of knowledge then any brick and mortar academy, as it offers all you have said, and we have the added blessing of being connected with multiple thousands of successful online entrepreneurs from around the world all helping one another! And – How many other companies are there where the owners are involved with their people every day, as they have a genuine desire to help others succeed? !